I don’t even know where to begin. 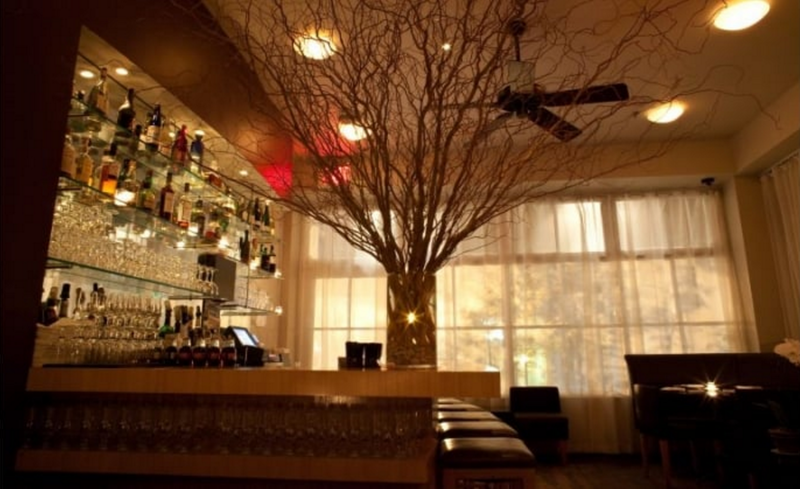 How BondSt can make it into ANYONE’s best of NYC Sushi/Omakase list is beyond me. Gayot, Foursquare, NYC.com, The New Potato – are you listening? Whoever you have making your lists, fire them. Fire them immediately! They clearly know NOTHING about fish! BondSt is straight up a FAKE sushi-ya. I can’t even claim them as a sub-par sushi-ya, it’s not even sub-par, it’s just plain ole BAD! You’re thinking, there has to be something good. Maybe… They have a great looking clientele. I’m talking model-esque-quality looking crowd. All dressed to the nines, the women with their hair and makeup done, and four+ inch heels, the men in their fancy custom shirts, cuff links, and designer loafers. This is a great place to bring a first date, dimly lit, romantic, swanky looking spot, great for people watching, and great for drinks. Especially if you sit in the front/main room! So long as your date knows nothing about sushi/fish, you’re golden. The back room, the sushi bar, had an entirely different vibe. It’s brighter, as it should be, but not blindingly so. This room feels more like Chinatown. Unlike other proper sushi-yas, the entire kitchen staff at BondSt is Chinese. The kitchen staff all spoke in Chinese, and were all VERY loud. This is not a “Japanese/non-Japanese restaurant” issue, it’s a “high end versus not” issue. You don’t have loud screaming staff at a high end restaurant! You just don’t. Except for maybe one, all other sushi chefs were also Chinese. I do not discriminate against non-Japanese sushi chefs, not at all. But it is odd that this Japanese restaurant don’t employ any Japanese people. 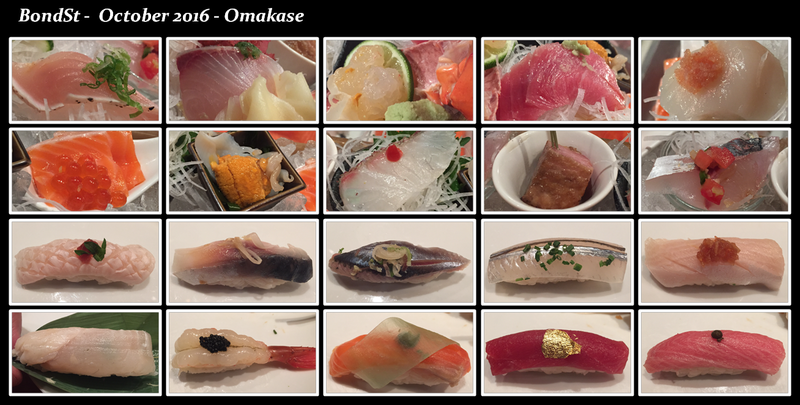 In terms of the food, I can honestly say that while the presentation here is beautiful, not one piece of sushi or sashimi I had tonight was of high quality or even the slightest bit fresh. Not a single one. And the rice was disgusting. In Japan, they truly train you in the art of making sushi rice. The proper balance between water, rice vinegar, sugar, salt, heat, and “fanning”. The rice at BondSt was hard, dense, and cold. My boyfriend LOVES rice, and he loves sushi rice. I don’t have the same appreciation for it. I enjoy rice, but tend to ask for less purely so I don’t fill up on it. Despite that ask I often have left over rice, especially in the later servings. Boyfriend always eats ALL of his rice, and even picks up my left over/extraneous rice. That is how much he loves rice. Today, we BOTH discarded ALL our rice from our sushi. That says A LOT. 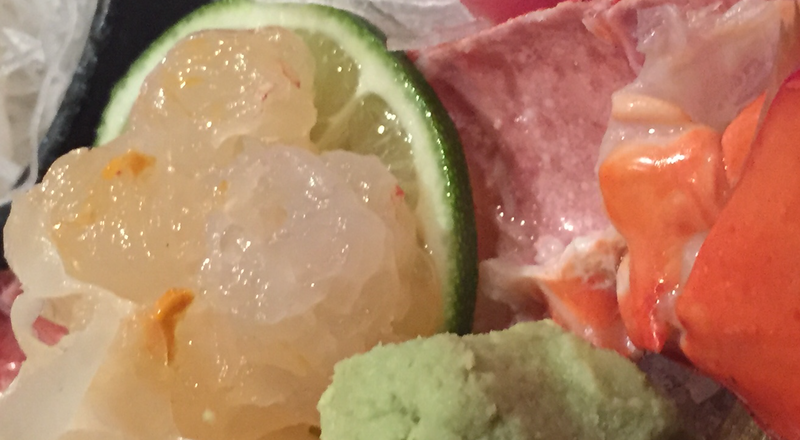 SASHIMI – Looks are so deceiving! 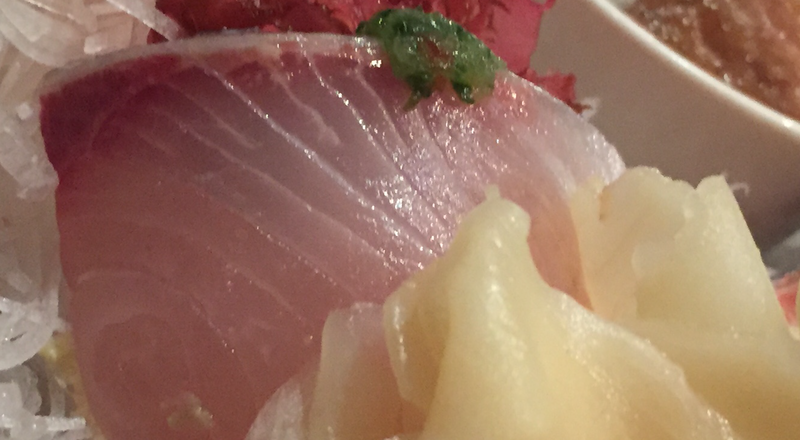 SEARED ALBACORE – Albacore Tuna should NEVER be served as part of an omakase. It’s a very inexpensive cut of fish that is avail at every single fish vendor. What’s worse than serving a low quality fish? A FISHY tasting low quality fish. 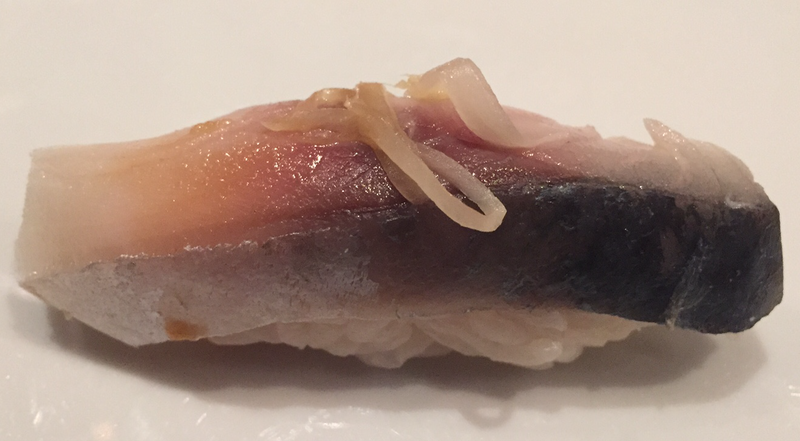 SHIMA AJI – SHIMA AJIs are my most favorite of the yellowtail family. This one was anything but. It was NOT fresh, it completely lost its crunch, and was again, fishy. Fresh fish is NOT fishy! 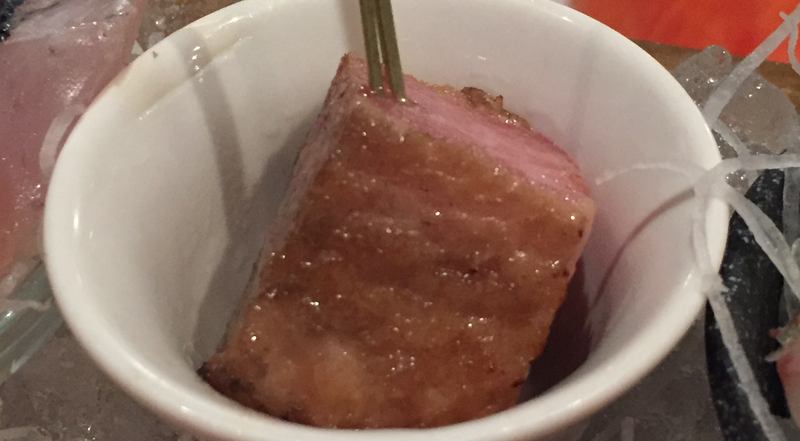 CHUTORO – How is this a CHUTORO? 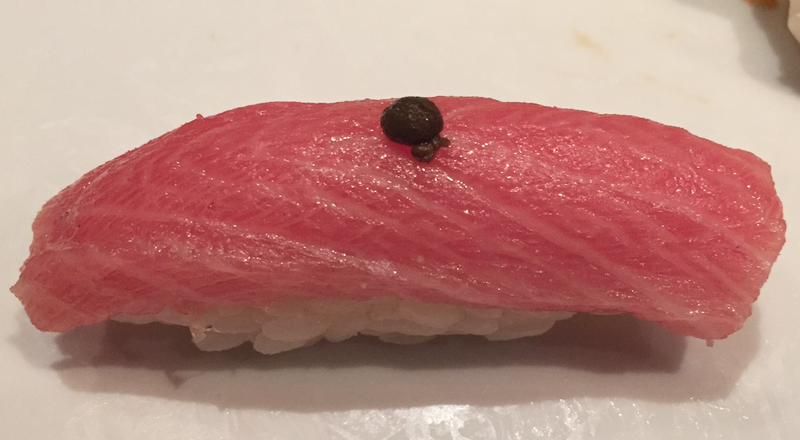 This was one of the leanest CHUTORO I have ever had. While this one was not at all fishy, it was still of poor quality. It definitively had that funky metallic aftertaste. HOTATE – I just gave DOJO a lesser rating on their HOTATE after having just gone to SOTO for one of the most amazing HOTATEs ever. And DOJO’s HOTATE was GOOD. The defrosted wet-packed scallop from my local super market was even better. What would make BondSt’s HOTATE acceptable to me? Only way I can imagine is if I just had HOTATE from a gas station. 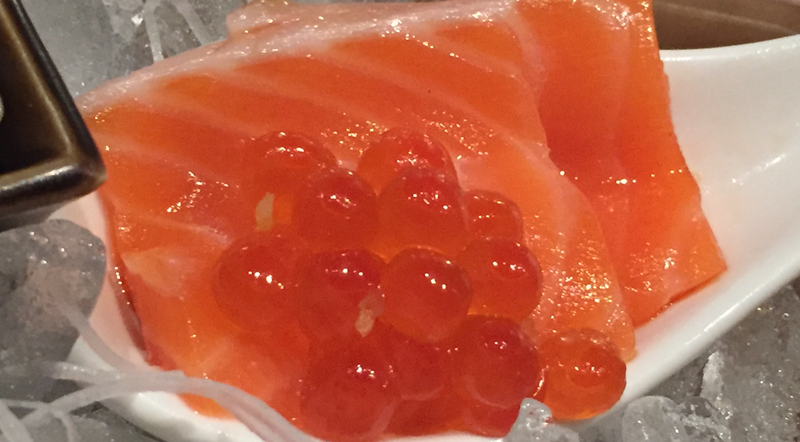 KING SALMON with IKURA – Surprisingly ok! This is the first serving that was acceptable. It might actually even be good. 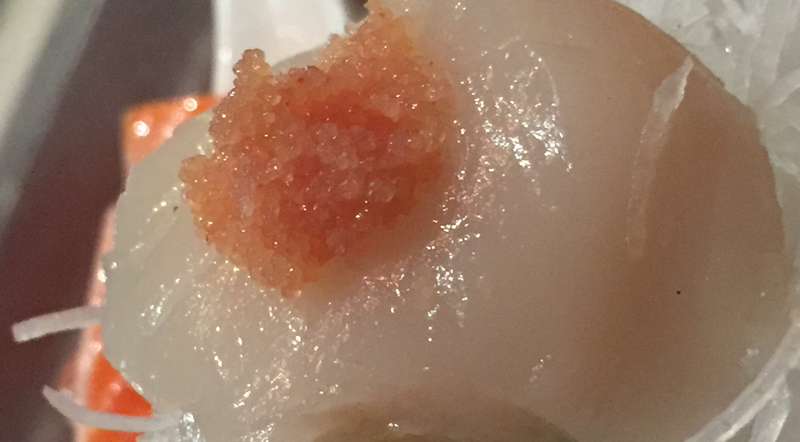 The IKURA, while not stellar, was better than expected. The salmon, while not a fancy breed, not like the wild sea trouts, was as least fresh. Plus, I’m that rare individual that prefers fatty farm raised salmon than the fancier wild cuts. 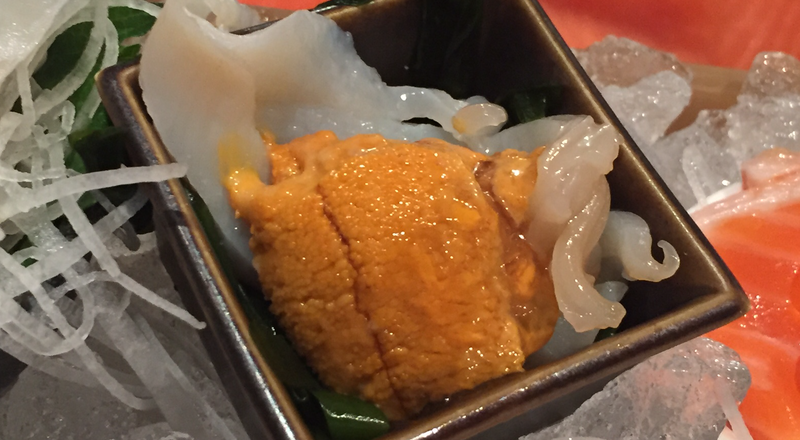 MIRUGAI with SANTA BARBARA UNI – As ugly as it looked, the UNI was surprisingly good. Second acceptable half piece! Why half, you ask? The MIRUGA was downright OLD. 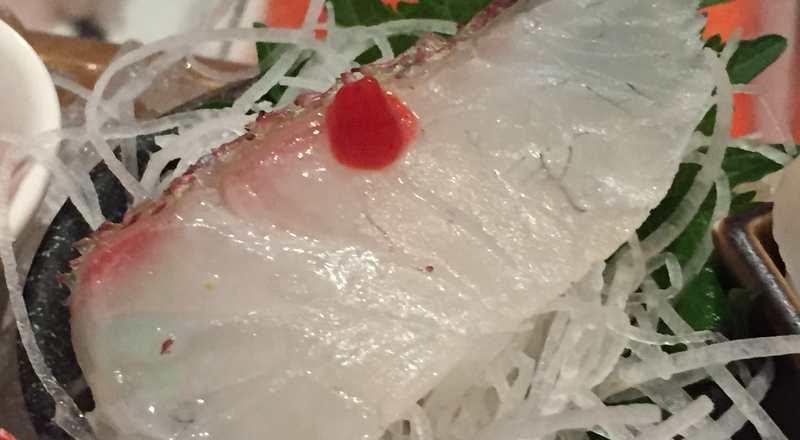 MADAI – Huge fan of the true Japanese sea bream. Too bad this one was no good. And I don’t even know what that crap was he put on top. 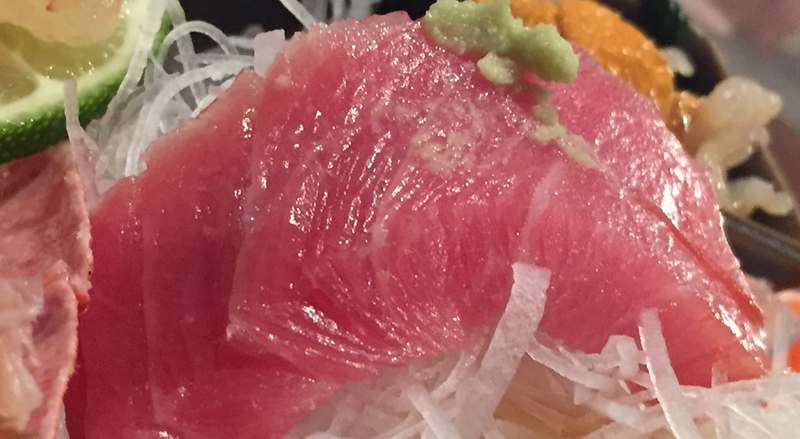 SEARED MARINATED OTORO – As OTORO would imply, this was INSANELY fatty, and overly seared. This was not a good cut to do this searing on. I took one bite and discarded the rest. 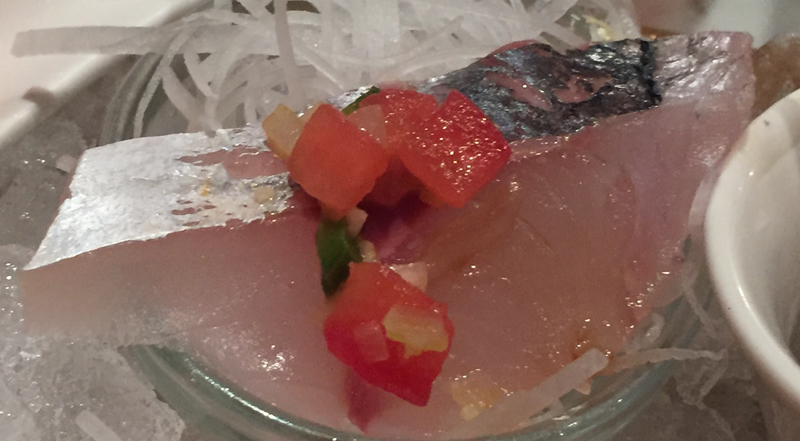 KAMPACHI – Usually my second most favorite yellowtail, but again, not fresh. 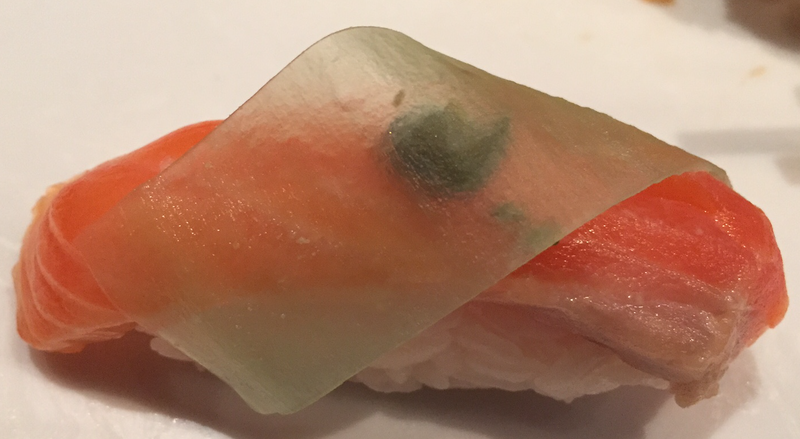 Complete gone is the beautiful gumminess, luster and crunch of a fresh KAMPACHI. Pardon my French, but WHAT THE F was with the salsa? Not a fan. 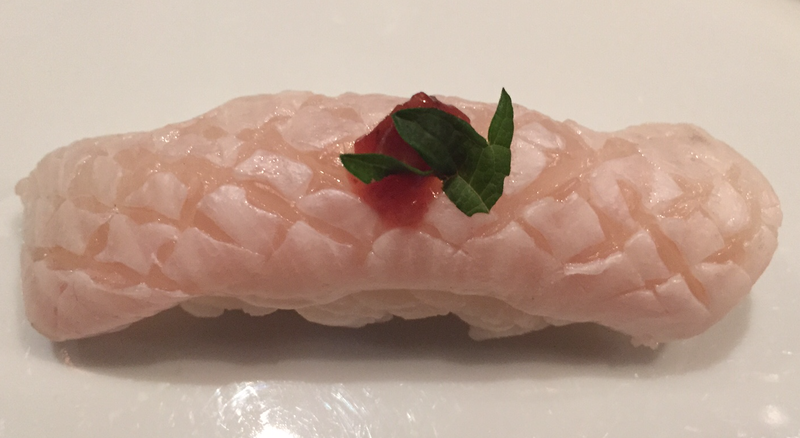 SUSHI – Again, looks are horrendously deceiving! 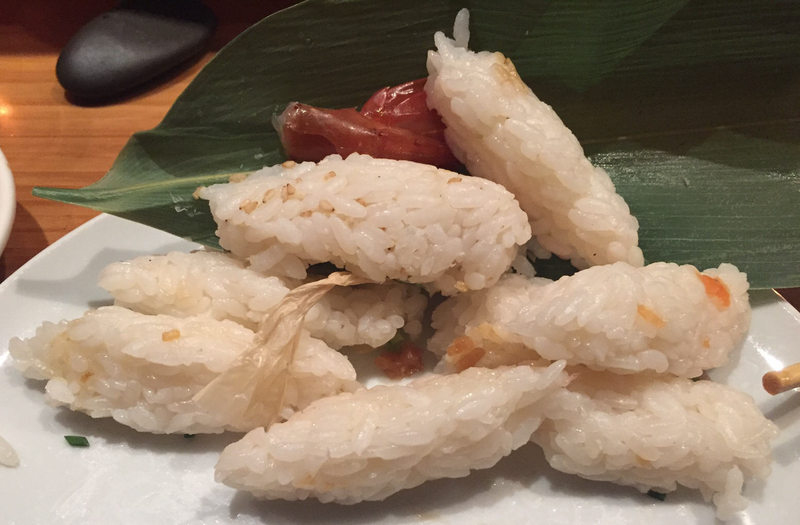 ENGAWA – Again, typically LOVE ENGAWAs, fin of the fluke, love the texture and the taste. Will ALWAYS order it if on the menu. This one was just DISGUSTING. Boyfriend who is much more forgiving when it comes to fish, labeled this “airport sushi”. I guess a step up from “gas station sushi”. SAWARA – I’m not a fan of SAWARAs. Never have been. 99% of restaurants do not make this well. Comparing this serving to our recent experience at DOJO makes BondSt extra bad. 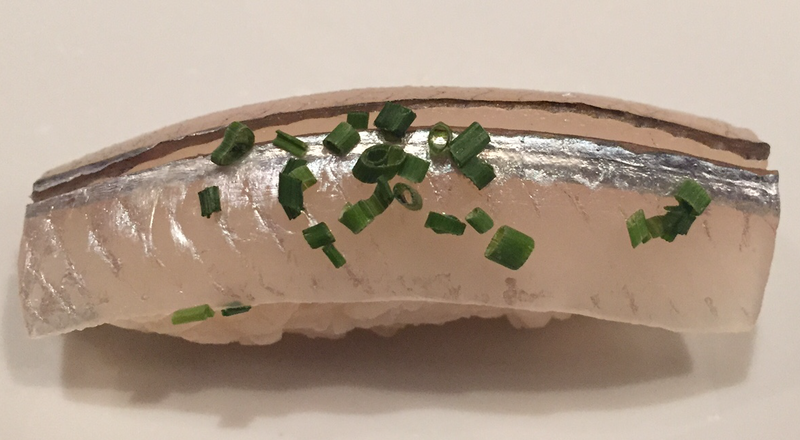 Actually, to think of it, there was ONE sushi-ya that makes me actually like SAWARAs, KURUMA ZUSHI. Other than DOJO and KURUMA ZUSHI, I’m still a no for all SAWARAs. 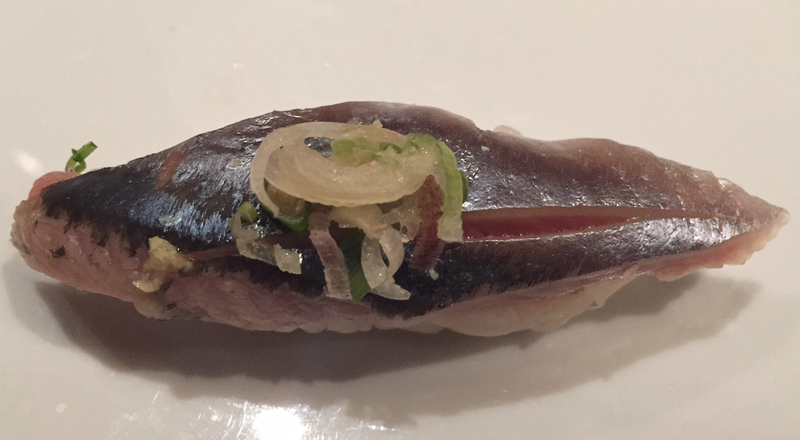 SANMA – Typically one of my top two silvers, this was blasphemy. Pure blasphemy. SAYORI – Needle fish. 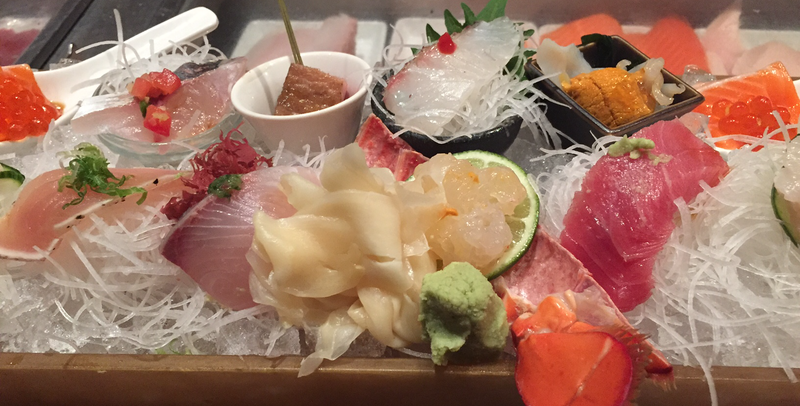 By the way, the Chef here does not know the Japanese names to all the fishes. He introduces them in English, and when I confirm the Japanese name, he tilts his head with that peculiar puzzled look, and then continues. SAYORIs are very hard to find in NYC, so you would think I’m happy. I wasn’t. This was NOT good, NOT fresh. FYI – USHIWAKAMARU has GREAT SAYORI. 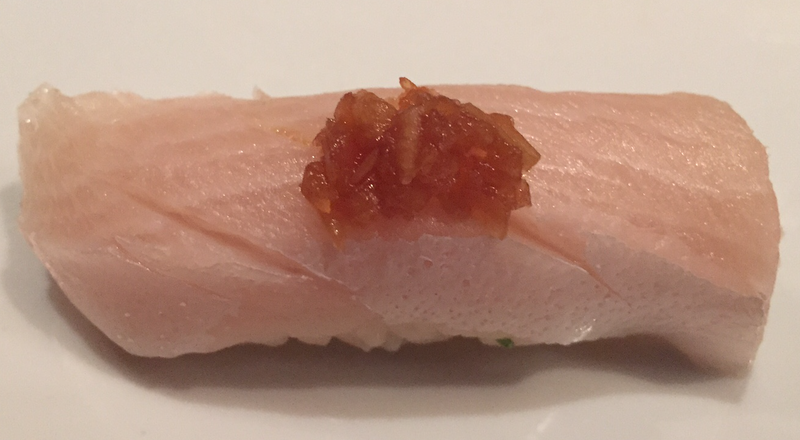 HAMACHI-SUNAZURI – Young yellowtail belly. See how it doesn’t even glisten? What is wrong with this place??? 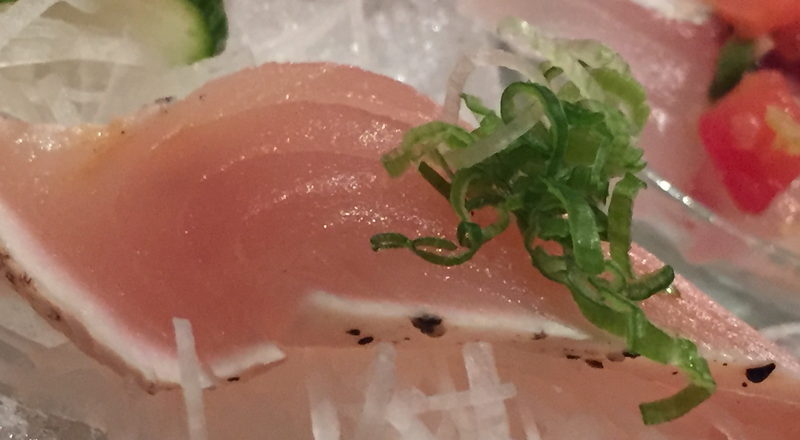 I truly have not ever had a bad HAMACHI-SUNAZURI at any high end sushi-ya, until now! 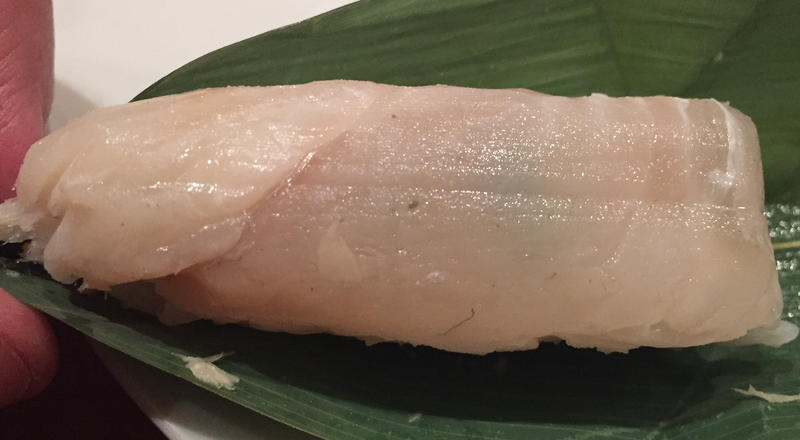 FLUKE marinated in banana leaf – You know who does this well? TANOSHI! And I’m not even a fan of theirs! BondSt’s banana leaf Fluke was disgusting. BondSt, here’s a tip – when marinating this fish, don’t marinate it with the rice. Where did they get their training? 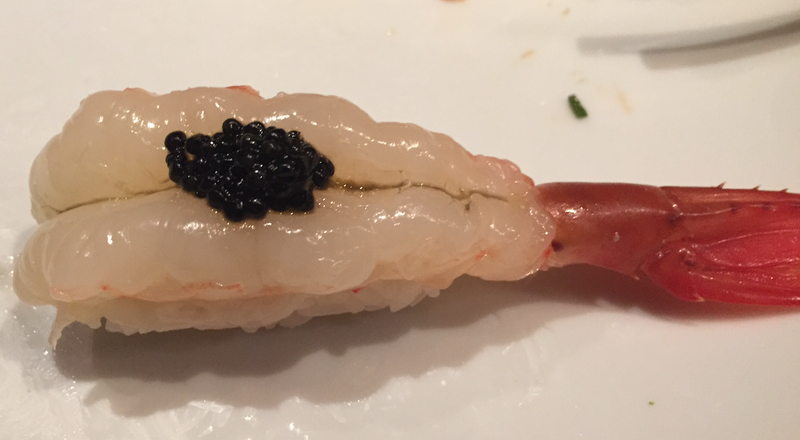 BOTAN EBI – It’s pretty hard to mess up BOTAN EBI given how widely available fresh BOTAN EBI is, but BondSt manages the impossible! And if you’re not going to give me quality caviar, please don’t bother giving me any at all. 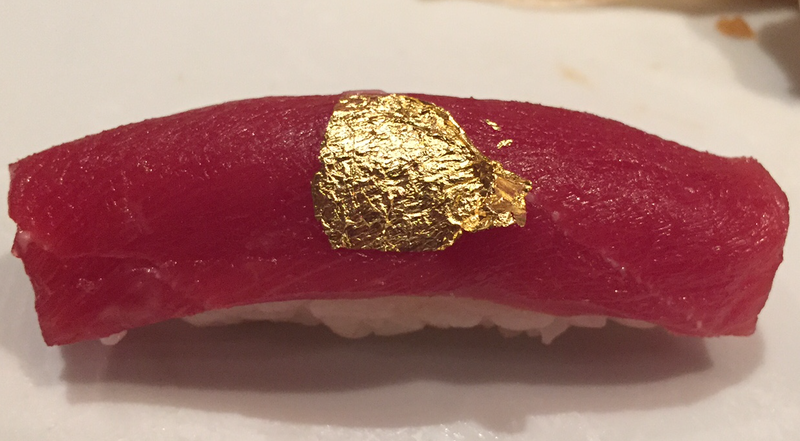 AKAMI – Other than the fancy gold leaf, this one doesn’t even look good. It looks like it’s been out for a decade. And it tasted that way. CHUTORO – Same old story. Looks somewhat pretty, but take off the topping and look just at the fish, and BLAH. Then you taste it, and triply BLAH. I really need a refund!!! BondSt is in no way a proper sushi-ya. The fish is bad, the sushi bar is unprofessional, an all around BAD time. 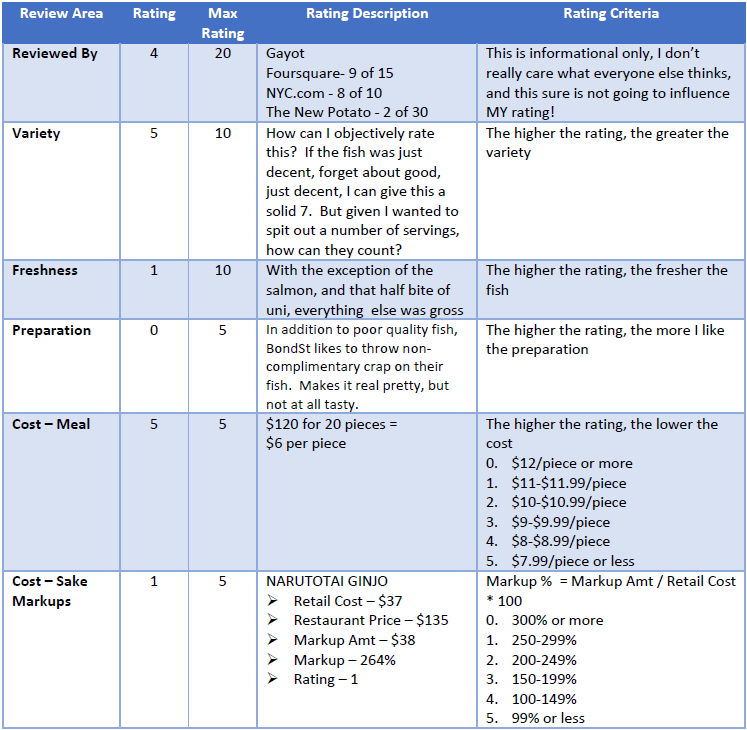 Overall rating of give me my money back, 12 out of 35.